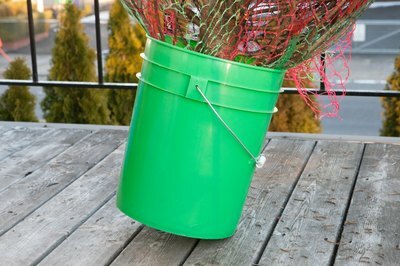 If you want to create a Christmas tree stand, consider using a bucket. A bucket will make the Christmas tree appear realistic if you use an artificial tree, and it serves the purpose of hydrating a real pine tree. The bucket must fit your tree, so you will need to take accurate measurements of the tree before purchasing a bucket to use as your stand. The most important aspect of using a bucket for a tree stand will involve stabilizing the tree to ensure that it does not topple over. Once your tree stabilizes, you can decorate the bucket to suit your decor needs. Measure the base of your Christmas tree with its stand. Choose a bucket that will hold your tree. The bucket will need to be sturdy and tall enough to hold the tree's weight. A small container will require you to support the weight of your tree with rocks and bricks. This will require experimentation to ensure that you stabilize the tree. Clean the container out with warm water and mild soap. If placing a real tree in the bucket, you will need to prepare the tree. Saw off 1 inch from the bottom of the trunk to create a fresh cut to allow water to absorb through the pores. 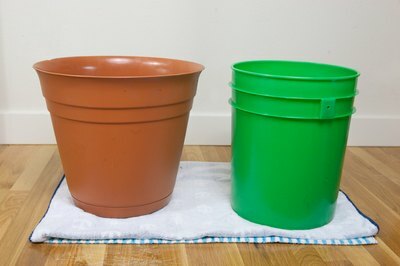 Fill the container with 2 to 3 liters of water, and do not allow the water level to drop below the tree’s trunk. Ensure that the tree is secure. 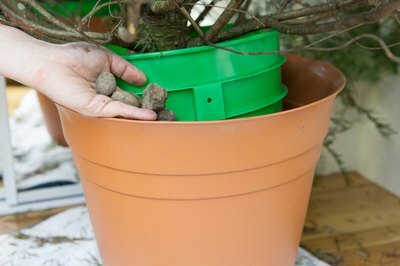 Use additional bricks or rocks inside your container or place them on top of the tree stand. You can use bricks and rocks to make your tree appear taller as well. Decorate the bucket. If the bucket holds an artificial tree, hide the base of the trunk with moss. 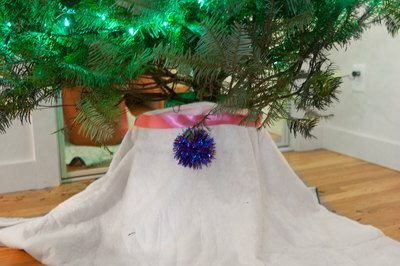 You can mask a real Christmas tree’s bucket by wrapping a piece of decorative cloth around the top of the bucket. Secure the cloth with a ribbon, and decorate the outside of the bucket with ribbons, tinsel and bows. Add the final additions to the tree. 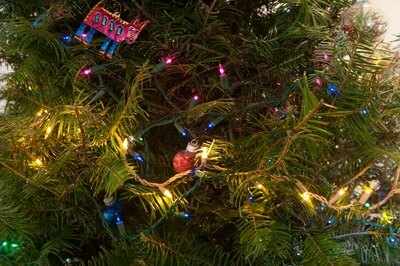 Once you secure the tree inside the bucket, add the ornaments and lights. Make sure the tree will fit inside your house before bringing it home. 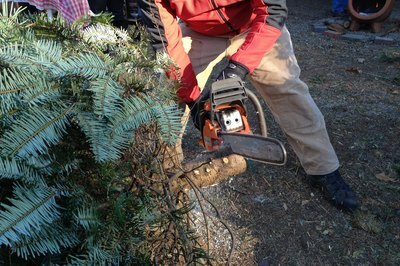 Add 1 quart of water for every inch of the tree's diameter when adding water to a real tree. When setting up the bucket for a real Christmas tree, do not add soil or sand to the bucket because it will block the pores, which will prevent the tree from being able to drink water.